Infiniti will build Mercedes-designed Q50 engines for Europe in U.S. 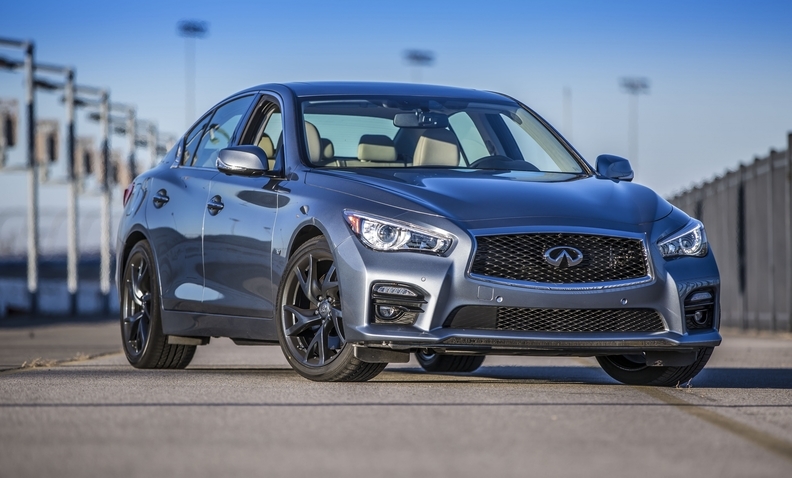 The Infiniti Q50 will have a U.S.-made engine, be assembled in Japan and be sold in Europe. NASHVILLE, Tennessee, USA -- Infiniti will begin production of a new Mercedes-Benz designed 2.0-liter four-cylinder gasoline engine in the United States this month, to power a version of the Q50 sedan for European markets. The plan to build the turbocharged unit, which starts June 26, is the latest piece of an ongoing global product-sharing deal between the Renault-Nissan Alliance and Mercedes' parent Daimler. It is also part of Infiniti's own strategy to reshape its worldwide product portfolio with European-accented models and engines. Separate from its position in the United States, Infiniti is slugging it out with European luxury manufacturers as it attempts to establish itself in Europe's primary markets. It has faced a difficult time there, limited by the catalog of engines produced by parent company Nissan. Last year, Infiniti's European sales fell 27 percent to 2,173 vehicles, according to JATO Dynamics. Infiniti will produce the four-cylinder engine on a plant line in Decherd that is separate from the booming Nissan-brand engine operations at Decherd in Tennessee -- another new facet of Infiniti’s image overhaul. Under Johan de Nysschen as worldwide president, Infiniti is attempting to more clearly distinguish itself from the mass-market Nissan brand. The $319 million engine line is designed with a distinct architecture, roofing and natural interior lighting, to differentiate it from the neighboring Nissan operation, which produces car and trucks engines for the U.S. market. Mercedes will receive the same Tennessee engine to use in its new-generation C class, which will launch this year at a factory in Vance, Alabama. The Tennessee plant will employ about 400 when it fully ramps up to 250,000 engines a year. The Q50 is assembled in Japan, where the Infiniti brand currently is not marketed, and exported to world markets. Nissan and Infiniti officials have waved away speculation that Infiniti eventually will move Q50 production to Aguascalientes, Mexico. Nissan last year opened a second assembly plant in Aguascalientes to produce the Sentra, but has acknowledged that other models will be added in time.